Any devoted Jane Austen fan knows every facet of the Bennet household, or do they? We follow the Bennets from the moment Mrs. Bennet announces with euphoric enthusiasm the arrival of Mr. Bingley to the neighborhood, then transition to sticking with Elizabeth as she visits friends and relatives. We have an intimate view of Elizabeth’s developing feelings and her changing sentiments regarding Mr. Darcy. But what do we really know about the Bennet household? Going behind the scenes to reveal the daily grind of life in such a household, Jo Baker brings us Longbourn from the perspective of the servants. The Longbourn staff consists of Mr. Hill, Mrs. Hill, Sarah, and Polly, with Sarah being the heroine. Sarah is a hard working young woman dealing with the demanding tasks of care and upkeep for a large family in a house with no indoor plumbing. Baker doesn’t hold back on giving the reader a full understanding of what that entails. The story begins in the wee hours of a washing day morning. Through the eyes of Sarah we see the arduous task for what it is with the five Bennet daughters all old enough to be out in society. For Sarah that means plenty of work, and there is no shortage of work for the Longbourn staff. One day’s work always seems to bleed into the next without any sense of getting caught up. Everything begins to change when a new man is hired. Sarah begins to long for notice, to be seen as interesting, to be seen as a woman. Life belowstairs becomes further disrupted by the stir Mr. Bingley’s arrival to the neighborhood caused abovestairs. This is where Longbourn begins to really stand on its own. We are given glimpses that allow Austen fans to have an idea where they are in reference to Pride and Prejudice. 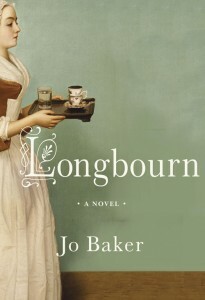 Any Janeite will enjoy the moments of crossover, but the real joy of Jo Baker’s Longbourn is that it is a wonderful story unto itself. The focus is on Sarah. In some ways she provides a more compelling heroine because of the complexity that exists for a woman coming into her own while facing the challenges of limitations and expectations for the working class. One of my favorite moments is when Mr. Collins comes to visit. Being familiar with Pride and Prejudice I know that his presence is unsettling to the Bennets and provides readers with many humorous moments at his expense. However, for the servants Mr. Collins represents something else entirely. In so many novels where servants may appear they are mostly portrayed with attitudes and views that make them seem more of an extension of the family they serve rather than independent characters. In Longbourn the servants are the characters and they are fully fleshed out with their own thoughts and personalities. Cliché though it may be to say, Longbourn is a must read. It’s the story of a woman living in her reality without pretense. In the way that Jane Austen wrote realistic characters navigating the social stratus within the world they lived, Jo Baker gives us the same.